While we hope our readers have enjoyed the various angles of vision incorporated into this series, such as considering the Mughal influence on Vaisnava India through art, culture and religious politics, we have also tried to emphasize the enormous damage visited upon Vaisnava culture. Nowhere is that more evident than in the long, long list of temples that the Muslims have destroyed. The importance of this subject is not just a matter of historical hindsight. Unfortunately, the destruction of Vaisnava and Saivite temples has continued over the last 300 years since Aurangzeb's death. In just the last 20 years, many more temples have been destroyed by the Muslims in Bangladesh, Kashmir, Pakistan, and elsewhere in Muslim dominated areas of the world, such as Indonesia. In our study of the early Mughal invaders, Babur and Humayun, and recently Akbar, we have heard historical reports not only of the destruction of temples and deities, but also the mass slaughter of people even outside of actual battles. Large numbers of women, children and unarmed men were also captured, spirited off and enslaved throughout the Islamic countries. An extensive study was undertaken by four authors -- Shourie, Narain, Dubashi, Swarup and Ram Goel – who surveyed the many Hindu temples that were destroyed, desecrated and converted into mosques and khanqahs. Their work was published in the book, Hindu Temples: What Happened to Them (1990), excerpts of which we will present over the next few segments of this series. We'll begin with an excerpt from Chapter 10, entitled "Let the Mute Witnesses Speak", which describes the earliest throes of the Islamic invasion, beginning around 650 A.D. As several of our readers have mentioned, the Mughal invasion of India covered more than 1,000 years, although this Sun series has referred primarily to just 180 years marking the Mughal emperors from Babur to Aurangzeb. But in fact, the destruction of Vedic temples has gone on for a millenia. The basis of argument for this approach to the true Mughal influence on Vaisnavism is set in this narrative from Hindu Temples: What Happened to Them"
"The cradle of Hindu culture on the eve of its Islamic invasion included what are at present the Sinkiang province of China, the Transoxiana region of Russia, the Seistan province of Iran and the sovereign states of Afghanistan, Pakistan, India, Nepal and Bangladesh. The Islamic invasion commenced around 650 A.D., when a Muslim army secured a foothold in Seistan, and continued till the end of the eighteenth century, when the last Islamic crusader, Tipu Sultan, was overthrown by the British. Hordes of Arabs, Persians, Turks, and Afghans who had been successively inspired by the Theology of Islam poured in, in wave after wave, carrying fire and sword to every nook and corner of this vast area. In the process, Sinkiang, Transoxiana region, Seistan and Afghanistan became transformed into daru'l-IslÃm where all vestiges of the earlier culture were wiped out. The same spell has engulfed the areas which were parts of India till 1947 and have since become Pakistan and Bangladesh. We learn from literary and epigraphic sources, accounts of foreign travellers in medieval times, and modern archaeological explorations that, on the eve of the Islamic invasion, the cradle of Hindu culture was honeycombed with temples and monasteries, in many shapes and sizes. 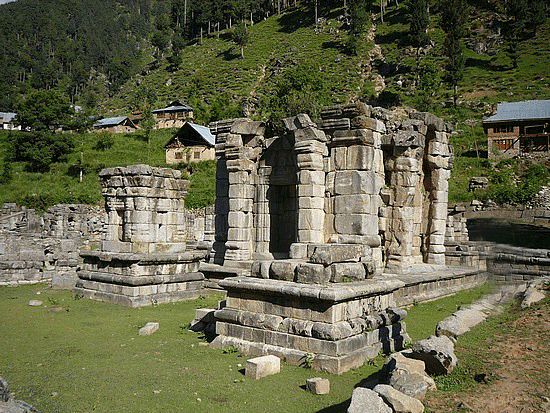 The same sources inform us that many more temples and monasteries continued to come up in places where the Islamic invasion had yet to reach or from where it was forced to retire for some time by the rallying of Hindu resistance. Hindus were great temple builders because their pantheon was prolific in Gods and Goddesses and their society rich in schools and sects, each with its own way of worship. But by the time we come to the end of the invasion, we find that almost all these Hindu places of worship had either disappeared or were left in different stages of ruination. Most of the sacred sites had come to be occupied by a variety of Muslim monuments-masjids and îdgãhs (mosques), dargãhs and ziãrats (shrines), mazãrs and maqbaras (tombs), madrasas and maktabs (seminaries), takiyãs and qabristãns (graveyards). Quite a few of the new edifices had been built from the materials of those that had been deliberately demolished in order to satisfy the demands of Islamic Theology. The same materials had been used frequently in some secular structures as well-walls and gates of forts and cities, river and tank embankments, caravanserais and stepwells, palaces and pavilions. Some apologists of Islam have tried to lay the blame at the door of the White Huns or Epthalites who had overrun parts of the Hindu cradle in the second half of the fifth century A.D. But they count without the witness of Hiuen Tsang, the famous Chinese pilgrim and Buddhist savant, who travelled all over this area from 630 A.D. to 644. Starting from Karashahr in Northern Sinkiang, he passed through Transoxiana, Northern Afghanistan, North-West Frontier Province, Kashmir, Punjab, Haryana, Himachal Pradesh, North-Eastern Rajasthan, Uttar Pradesh, Bihar, Nepal, Bengal, Assam, Orissa, Mahakosal and Andhra Pradesh till he reached Tamil Nadu. On his return journey he travelled through Karnataka, Maharashtra, Gujarat, Madhya Bharat, Sindh, Southern Afghanistan and Southern Sinkiang. In most of these provinces he found in a flourishing state many Buddhist establishments consisting of vihãras(monasteries), chaityas (temples) and stûpas (topes), besides what he described as heretical (Jain) and deva (Brahmanical) temples. The wealth of architecture and sculptures he saw everywhere confirms what we learn from Hindu literary sources. Some of this wealth has been recovered in recent times from under mounds of ruins. During the course of his pilgrimage, Hiuen Tsang stayed at as many as 95 Buddhist centres among which the more famous ones were at Kuchi, Aqsu, Tirmiz, Uch Turfan, Kashagar and Khotan in Sinkiang; Balkh, Ghazni, Bamiyan, Kapisi, Lamghan, Nagarahar and Bannu in Afghanistan; Pushkalavati, Bolar and Takshasila in the North-West Frontier Province; Srinagar, Rajaori and Punch in Kashmir; Sialkot, Jalandhar and Sirhind in the Punjab; Thanesar, Pehowa and Sugh in Haryana; Bairat and Bhinmal in Rajasthan, Mathura, Mahoba, Ahichchhatra, Sankisa, Kanauj, Ayodhya, Prayag, Kausambi, Sravasti, Kapilvastu, Kusinagar, Varanasi, Sarnath and Ghazipur in Uttar Pradesh; Vaishali, Pataliputra, Rajgir, Nalanda, Bodhgaya, Monghyr and Bhagalpur in Bihar; Pundravardhana, Tamralipti, Jessore and Karnasuvarna in Bengal; Puri and Jajnagar in Orissa; Nagarjunikonda and Amaravati in Andhra Pradesh; Kanchipuram in Tamil Nadu; Badami and Kalyani in Karnataka; Paithan and Devagiri in Maharashtra; Bharuch, Junagarh and Valabhi in Gujarat; Ujjain in Malwa; Mirpur Khas and Multan in Sindh. The number of Buddhist monasteries at the bigger ones of these centres ranged from 50 to 500 and the number of monks in residence from 1,000 to 10,000. It was only in some parts of Eastern Afghanistan and the North-West Frontier Province that monasteries were in a bad shape, which can perhaps be explained by the invasion of White Huns. But so were they in Kusinagar and Kapilavastu where the White Huns are not known to have reached. On the other hand, the same invaders had ranged over Punjab, Haryana, Rajasthan, Madhya Pradesh and most of Uttar Pradesh where Hiuen Tsang found the monasteries in a splendid state. They had even established their rule over Kashmir where Hiuen Tsang saw 500 monasteries housing 5,000 monks. It is, therefore, difficult to hold them responsible for the disappearance of Buddhist centres in areas where Hiuen Tsang had found them flourishing. An explanation has to be found elsewhere. In any case, the upheaval they caused was over by the middle of the sixth century. Moreover, the temples and monasteries which Hiuen Tsang saw were only a few out of many. He had not gone into the interior of any province, having confined himself to the more famous Buddhist centres. Muslim historians, in India and abroad, have written hundreds of accounts in which the progress of Islamic armies across the cradle of Hindu culture is narrated, stage by stage and period by period. A pronounced feature of these Muslim histories is a description-in smaller or greater detail but always with considerable pride-of how the Hindus were slaughtered en masse or converted by force, how hundreds of thousands of Hindu men and women and children were captured as booty and sold into slavery, how Hindu temples and monasteries were razed to the ground or burnt down, and how images of Hindu Gods and Goddesses were destroyed or desecrated. Commandments of Allah (Quran) and precedents set by the Prophet (Sunnah) are frequently cited by the authors in support of what the swordsmen and demolition squads of Islam did with extraordinary zeal, not only in the midst of war but also, and more thoroughly, after Islamic rule had been firmly established. A reference to the Theology of Islam as perfected by the orthodox Imams, leaves little doubt that the citations are seldom without foundation."